Around the web has been filled out, along with an interesting quote about bluetooth. Handspring today introduced the 2nd generation model of their communicator family, the Treo 600. Readers of TreoCentral should be familiar with this new Treo - thanks to information gathered from several of our readers we reported on it is existence earlier this month. Handsprings' announcement today confirms our initial reports, with only some minor changes to the spec sheet. TreoCentral's Michael Ducker and Marcus Adolfsson had a chance to speak with Michelle White, Product Manager for the Treo 600, extensively about the Treo 600 on Tuesday night. She provided us with valuable information, although she couldn't answer all of our nosy questions. "In product design, making things smaller often makes the product better because it forces designers to break through old design ideas. Treo 600 truly is a breakthrough for smart phones," said Jeff Hawkins, chairman and chief product officer for Handspring. "Our team was very creative in shrinking the product to an impressively small size, while at the same time making it more powerful and easier to use. As a phone and a data device, Treo 600 delivers the best of both worlds." The sleek design is the result of significant research and development focused on reducing size, maximizing the utility and ease of use of both phone and data functions, and minimizing trade-offs typically found in converged products. All products in the new series, to be called Treo 600, will combine a world-class phone, a Palm OS 5-based organizer with messaging, email, and web browsing features. The first Treo 600 products are expected this fall. Two different hardware versions of the Treo 600 will be available: A dual-band CDMA radio (800/1900 MHz Digital only) and a quad-band GSM/GPRS radio will power respective versions of the product. Service providers will be able to specify what software comes pre-loaded on the device. Handspring is working with leading wireless operators including Sprint in North America and Orange S.A. throughout Europe to customize the product for their respective networks, applications and brands. Unlike the Treo 300, Sprint does not have exclusivity to the Treo 600, so other CDMA carriers can carry the device if they choose too. For the US market, the Sprint CDMA version is expected to be released this fall, with an unsubsidized carrier-less GSM version to follow. T-Mobile or Cingular has yet to be commit to the Treo 600. Treo 600's keyboard design makes dialing the phone and sending messages and email easier than before, even with the significantly reduced size of the product. A unique domed key shape and carefully crafted layout makes typing fast and simple. Each key on Treo 600 has more surface area than those on existing Treo products, and letters and numbers have been enlarged for better readability. In Handspring's user testing for speed and accuracy of text input, Treo 600 performed on par with RIM's Blackberry keyboard and significantly faster than Graffiti handwriting recognition, found in most Palm OS handhelds, and T-9, the text input method found in most mobile phones. As with the Treo 270 and 300, the keyboard is backlit. Since the keyboard is no longer protect by a cover when not in use, a new application KeyGuard protects the keyboard and touch screen from unintentional presses. KeyGuard can be activated automatically each time the unit is turned off, or after a specified time-out. It can also be activated manually, by pressing option and the new screen button. The new screen button is located at the outer right of the application buttons, and replaces the Browser button. This button simply turns the screen on and off, so it acts as a power button for the PDA part of the device. By pressing this key, you can always return to the screen displayed when you turned the Treo off. Additional keyboard changes: A dedicated Home/Application Launcher button is now available to the right of the keyboard, and some of the List Types keys have been moved. List Type is the Treo's way off accessing special characters. The five-way navigation system (up, down, left, right, center) is a welcomed addition. The pad is tightly integrated with the core software, and makes it easy to move within and between applications using one hand. According to Michelle, the integration is so superb that the stylus is only really needed for applications that are not 5-way enabled. The pad uses a new API, so it is not compatible with software that uses Palm's or Sony's existing API. Handspring will shortly release programming documentation for developers so they can add navigation support to their applications. On a positive note, PalmSource and Handspring has agreed that Handspring's naviation API will be the standard for Palm OS 6. The QWERTY keyboard is also tied closely to the software to make it usable for much more than data entry. For example, phone numbers, applications and even specific application functions (such as looking up a specific web page or addressing an email) can be assigned to any of 26 different keys for instant one-touch execution. Treo 600 products will feature an ARM processor and Palm OS 5 for fast performance, especially beneficial for accelerating graphics-intensive applications, managing large databases, and for multimedia functions like sound and video playback. Specifically, the Treo 600 family utilizes a Texas Instruments OMAP 310 ARM processor which runs at 144 MHz. This is the same processor that runs the Palm Zire 71. The OMAP 310 has a built in LCD controller, USB Host and client functions, multiple serial ports, built in camera interface, and support for an SD/MMC slot. It has a maximum frequency of 175 MHz, with a 1.5v power draw. A tech sheet for this processor is here. The Treo 600 family features a full color screen with a resolution of 160x160. While this is not what many TreoCentral readers had hoped for, a lower resolution screen is better on the battery, and more practical for such a small device. The screen has been described to us by one individual as "blindingly bright", and it is viewable both indoors and outdoors. The dot pitch is 0.27. The Treo 600 family also adds an SD/SDIO/MMC slot. This slot, located on the top of the device was also found on the Treo 90, and on all current Palm models. It enables the use of SD and MMC media for storage of more programs and MP3 audio or video and SD content cards like dictionaries, or game packs. More importantly it also is SDIO enabled, meaning that it will work with hardware accessory cards like Veo's SD photo card, Margi's SD presenter-to-go, or Sandisk's upcoming Wi-Fi and Bluetooth cards. Handspring did not include Bluetooth into this device, but because of the SDIO slot it is an option in the future. Handspring told us that they are working with 3rd party companies to extend all the powers of the Treo to the Bluetooth card. This includes not only data synchronization like most cards, but the ability to use Bluetooth headsets, or act as a Bluetooth modem for a PC or Mac. Adding a Bluetooth SD card to the Treo 600 family will cost around $100 to $150. The current Palm branded card does not work with OS 5. Phonescoop.com gives this interesting quote though: "Speaking of Bluetooth, the Handspring engineers specifically left room on the Treo 600 circuit board for a Bluetooth module. It won't be included in initial releases, but Handspring spokesperson Brian Jaquet said there was very strong possibility that an updated version would be released with Bluetooth." BusinessWeek comfirms this idea of a possibility of an entire family of Treo 600's. " According to Shirai, the company could eventually come out with an entire family of models based on the Treo 600, for instance, low-end models with fewer features or higher-end versions with improved multimedia capabilities." Probably the largest change that the user will never notice is the entirely revamped audio system that the Treo 600 now has. For the first time ever, Handspring has integrated the microphone into the Palm unit itself. (Visor models microphone linked directly to the springboard, earlier Treo's linked directly to the radio) Handspring will not bundle recording software with the device, however they will soon make the API's available for developers to write that software. Developers can also access the phone stream to record the conversation, and with the 144 MHz processor perhaps encode it as an MP3 and store it on an SD card. Handspring also changed the speaker set up for the Treo 600. They have implemented a dual speaker architecture with one speaker on the front, and one on the back to give maximum sound quality. The speaker on the front is in the earpiece and is used for the phone. The speaker on the back is a large, non-piezo speaker offering the capability of playing music, ring tones, or anything in large range of tones. MP3 playback is one of the best uses of the faster processor in the Treo 600. Handspring is working with all third party vendors to ensure that their MP3 software is compatible with the new Audio Architecture of the phone. MP3's can be played through the back speaker, or through the headset jack located at the bottom of the device. At launch time Handspring will be offering an accessory to convert the 2.5 mm jack into a standard 3.5 mm stereo headset jack. A VGA (640x480) camera is built into the back of the Treo 600. This has been tightly integrated into the Treo 600 software allowing it to be used to take normal JPEG pictures, send pictures using MMS or picture messaging, setting up picture caller ID, and adding backgrounds to the main phone screen. However, one cannot use the built in software and camera to record video. Unlike with the audio, Handspring has not committed to sharing any API's to the camera for third party developers to use. If they did, video conferencing very well might be possible. A dual-band CDMA radio (800/1900 MHz Digital only) and a quad-band GSM/GPRS radio will power respective versions of the product. The CDMA radio supports Sprint's e911 GPS technology, and works with their Vision high-speed data network. The GSM version is a true world phone, and will support 4 channels up, and 2 channels down (only 5 at once however). I believe that this means it is class 10 GPRS device. It will be able to receive at up to 48 kbps. (Almost standard dialup speeds) Handspring refused to comment on the specifics of the suppliers of each radio, and the other technology that they may support. A paltry 2.5 hours of talk time was claimed. The Treo 600 changes this, and built in is an 1800 mAh battery. Handspring claims 6 hours of talk time with the GSM version, and 5 hours with the CDMA. We were also told that an external battery which will clip on the back will be available at launch, or soon after launch. It will be 1200 mAh. Handspring has kept the same data connector that all Treo's so far share, and claim that all existing cables and chargers will be compatible. To use OS 5 to its fullest, Handspring rewrote much of the software for the phone user interface. When you hit the phone button you are taken to a skin able, customizable "start page". From this start page the user can navigate using the dial pad to any application that they have configured. By default, speed dial, phone book, dial pad, Blazer, email will be listed. Direct dialing with the keyboard is still possible from this view. Also, Handspring has kept the same address book with quick lookup features. Speed Dial supports several new features including the ability to setup photo caller ID. A nifty why didn't they think about that before feature is the ability to hit space over any speed dial entry and get the full list of phone numbers for that individual. There are 50 spaces in the Treo 600 families speed dial. Handspring is working with carriers and business partners to prepare rich email, SMS, and MMS solutions that will be customized for specific channels and announced in more detail this summer. GSM models will include an MMS client that is integrated with the Treo camera, and Sprint CDMA version will include a custom picture messaging software. On the GSM version, Handspring has added a new feature to SMS called SMS chat view. When having a multi-sms conversation with somebody the rapid succession of messages can clutter up the inbox. Using chat view it combines all these recent messages from one person and turns it into a clean window that looks a lot like IM. No word on Sprint 2-way text messaging. We wondered why Handspring got rid of the proxy, since in our opinion the automatic down sampling of images was a helpful feature to speed up connections. Handspring told us that none of the carriers wanted to have this middle ware solution. All in all, Handspring claims Blazer has been significantly improved to be a better web browser for the Treo, with a better interface thanks to the five way navigator. The GSM version of the Treo 600 will include a yet to be named third party POP3 mail client. I don't know if Handspring is listening, but TreoCentral readers think much better of SnapperMail than Handspring's own TreoMail. (hint hint) The CDMA version will include the carrier's own mail client of choice. Treo 600 series products are expected to come at a price premium relative to current Treo offerings, and Handspring plans to offer a compelling trade-up incentive for owners of wireless Treo products. No comments could be provided for the compelling trade-up incentive, or pricing. However Greg Shirai of Handspring claimed in a CNET video a possible price range of $400-$500. Sprint and PalmSource, provider of the world-leading Palm OS, will show the Treo this week in their exhibits at CeBit America in New York. Handspring didn't just share the new info exclusively with us. Below are some of the more interesting stories about the Treo 600. 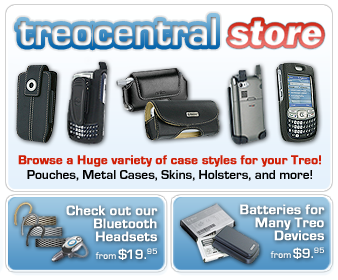 - Cnet has a very informative 7 minute video on the Treo 600 including much footage. - Handspring has a sneak peak page which includes a video of Jeff Hawkins from the Sprint Users Conference showing off the device. -Wireless-doc.com was at CeBit today and had a chance to snap a photo of the Treo 600 alongside a Treo 300. -BargainPDA has a couple more pictures from CeBit. -Mobile Burn has some very excellent pictures of the new interface. -PhoneScoop has great photos and an article with some good quotes by Brian Jaquet.